The Executive Coordinator of the United Nations Volunteers (UNV) programme, Olivier Adam, has kicked-off his tour of East Africa with a visit to Tanzania. He discussed opportunities to strengthen partnerships with the United Nations agencies and with Zanzibar, and also learned from the experiences of UN Volunteers serving across the country. 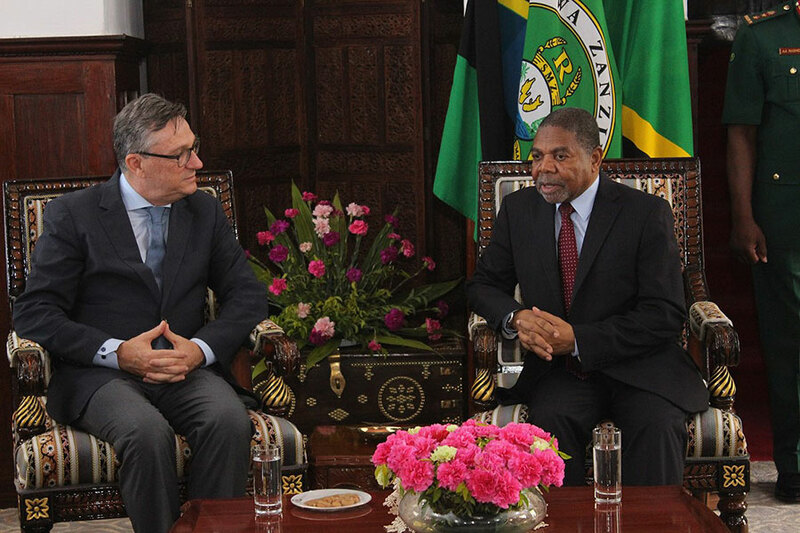 UNV Executive Coordinator Olivier Adam meets the President of Zanzibar, Tanzania, H.E. Dr Ali Mohammed Shein. With a population of over 50 million people and borders with eight different countries – it’s safe to say the United Republic of Tanzania is an important player in the East African region. The United Nations plays a significant role in Tanzania, with 23 UN agencies working closely with the government to implement development and humanitarian activities – including the hosting of over 300,000 refugees from the Democratic Republic of Congo and Burundi. UNV is collaborating with different UN entities across the country, with 73 UN Volunteers serving communities in 2018 in order to find durable solutions in multiple sectors, including health, education, women’s economic empowerment and ending gender-based violence. During his visit to Tanzania, UNV Executive Coordinator Olivier Adam, met with a number of UN Volunteers to learn about their accomplishments and some of the challenges they have faced. Mr Adam also met with the UN Resident Coordinator and heads and representatives of the UN agencies, where he advocated for the UN Country Team to provide more opportunities for volunteerism in support of the Sustainable Development Goals. Currently, 80 per cent of the 49 UN Volunteers deployed in Tanzania are spread across just three agencies: the United Nations Development Programme (UNDP), UN Refugee Agency (UNHCR) and UN Women. Mr Adam reiterated UNV's commitment to working with UN agencies to leverage the talent and enthusiasm of volunteers to enhance the impact of existing programmes in-country. During his visit to Tanzania, the Executive Coordinator visited Zanzibar, where he met with the President, H.E. Dr Ali Mohammed Shein, and got the chance to discuss how UNV can support the Revolutionary Government of Zanzibar’s development priorities. Among the areas of potential collaboration that the President highlighted were finding volunteers to support the teaching of science and mathematics in schools where there is currently a shortage, as well as providing technical expertise to hospitals to build capacity for specialization in areas such as orthopedic surgery. Mr Adam and President Shein also discussed the possibility of integrating volunteers into an incubation centre, where UN Volunteers could help women and youth to develop entrepreneurship skills. This article was produced with the kind support of Edgar Kiliba.